The official blog of Windhorse Tarot, located in Suffield, CT. With over 15 years of experience in the Tarot, this blog is intended to cover a little of everything Tarot related, from reference material to new developments in an ancient art. I'm available for consultations any time, feel free to call, email or stop by our website for more information! As always, your humble friend and narrator. Spring has sprung, and April is upon us. This month brings the spring equinox, and with the spring, the first stirrings of new life. It’s time to celebrate Easter, or Ostara, or Eostere, or however you spell it or recognize this time of the year. But I don’t think I’m alone when I say I’m pretty happy to see warm weather here, and the return of green to the trees and earth. Perhaps this has been apparent earlier on as well, as the weather has gotten warmer and the ground has thawed, and rivers and streams swell with snowmelt. No matter how dark and cold the winter, our ancestors knew that as the seasons turned, the sun was never far. The world may not always follow the schedule we want it to, but it does keep on moving, and the only certainty is change. So let’s see what this month will bring as a new month greets us! Now’s the time to roll up your sleeves- and play in the dirt! There are a couple changes here from last month’s Ace of Swords, and the Page points to the need to experiment and try out new directions. 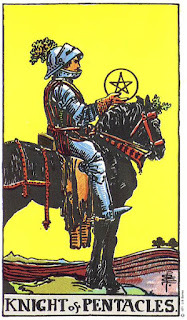 The suit of Pentacles promises a very hands-on month, with plenty of room to experiment. 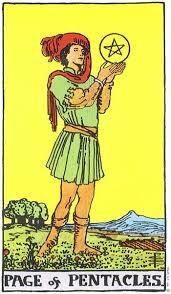 The Page of Pentacles is, in a symbolic sense, a little kid, learning by experience. But kids learn a great deal by playing and exploring, and curiosity should certainly be embraced this month. The month ahead looks fairly open, and you’ll be able to look forwards to an environment that allows a great deal of freedom. 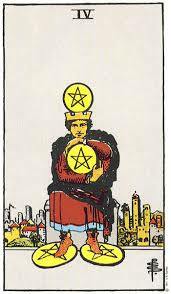 Things have been building up for you, and you’ve been vacillating between Pentacles and other suits for the past few months. Now it’s time to have some fun, and though it may seem like you’re just playing around, keep an eye on what themes and ideas keep cropping up for you. Pages are receptive figures, and sometimes that direction you’re looking for comes when you’re relaxed and enjoying yourself rather than when you’re actively seeking it out. April is a good month to take a break, not always an easy thing for you- but don’t feel like you have to do too much this month, as a good deal is going on beyond where you may be looking. What’s at the end of your road this month? Previously, the Chariot was all about movement and overcoming, and now you see the Ace of Cups, perhaps like the Holy Grail. 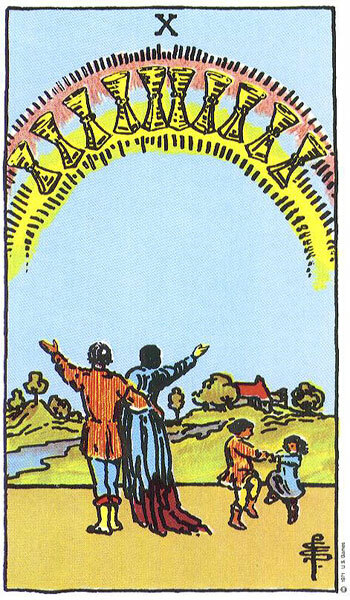 You’ve made it a good distance, and now feel free to enjoy the blessings this card indicates. The Ace isn’t a card of endings and settling down, true. But here it takes on the sense of a reprieve. If you’ve been traveling a long distance, in whatever symbolic sense that may apply, take some time to enjoy what’s given to you. There’s a focus on happiness here, and developing intuition. This may not be something you rely on too heavily, with the Sun as your ruling planet, and cardinal Fire as your element, but emotion can be a strong driving factor this month. Make sure your goals are true- here that intuition comes into play once more. Don’t be deceived or tricked into following a false fire. Remember the end of Indiana Jones and the Last Crusade, when you drink from the wrong cup? Don’t worry, the choices ahead of you are clear, and false friends who might hand you the wrong cup just to see what would happen are not to be found. Stick to the obvious, and perhaps more importantly, the path you’ve so far followed. Time to gain strength from a pleasant and gentle month ahead, and though there may be more to come, enjoy what you’ve earned so far. 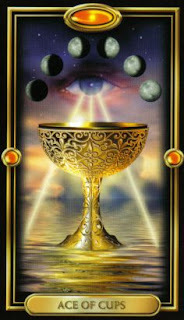 Cups seem to be making an appearance across your sign this month, and the 10 of Cups brings a welcome upswing. The previous Ace of Pentacles means you’re doing all right, and you’re multiplying good fortunes. However, the 10 can also indicate a new direction here. The focus for you is on family, loved ones and taking care of yourself. Get outside, enjoy the sunshine, and have a good time. But you’ve also been diligent, it seems. And that’s starting to pay off. It seems unlikely that you’d prosper in something your heart and enthusiasm weren’t in- though this is true across the three Aries decans, it’s certainly most true for you. 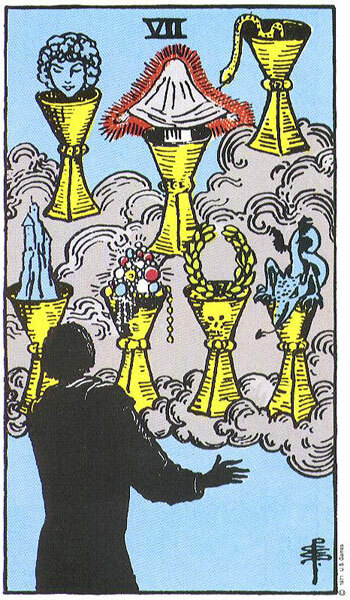 The fact that we have this 10 appearing as it does in the suit of Cups tells us that you should be putting all your eggs, so to speak, in one basket. Apply yourself, not across multiple fronts, but where you feel like you can be the most successful. You’re no stranger to hard work, so let that very same diligence work for you now. The 10 is a card of comfort and success, true, but you can also let this be a new starting point. No rush, and no need to hurry along, things are working well for you and there’s a strong response to the effort you put forth. Enjoy what you’ve earned, and the company of those who have remained by your side. It’s been something of a roller coaster for you coming up to the spring, but now it’s time to put all that behind you. 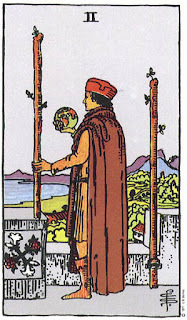 Ever practical and thinking, you’re faced this month with the 2 of Wands, and decisions to be made. Which way to go, and how to build on the 10s that have come previously? Your focus this spring is not on building up- you’re pretty much all set there, and it looks like a good deal is in place. Listening to others can help you out, but remember that the decisions ultimately are yours. Don’t hand off responsibility to other people for your happiness. Pursue that happiness with a determined mind. It’s an interesting combination when we have the Fire of the suit of Wands combined with your natural fixed Earth nature, Taurus. You may take time arriving at a decision and making up your mind, but once you do, it’ll take a very big lever to move you out of that decision or to make you change your mind. In this case, being slow to decide is a good thing, and once you choose a path, stick to it and see it through. Remember that in many depictions the Wands are flowering or budding- you’ll find that once you commit and start applying that mighty Taurus force to the path you choose, things will gain momentum for you. There’s a great deal hanging in the balance, and so you can tip the scales whichever direction you may choose. So you’re doing well not to rush into that decision, but at the same time don’t let consideration turn into uncertainty and rushing into a choice just to be shut of the tension. As the twig is bent, or as the new growth of spring is bent, so the path is determined for you in the weeks and months to come. There’s another Major Arcana card for this month, and a surprising difference! Look at the Star as a navigational aid, and as an indication of clearer skies this month for you. The dust is settling from the Tower back in March, and now it’s time to see what has been revealed. The Tower represented a need to let go, a need to let the sun in, even if it meant putting a few more holes in the walls. Well, now that the upheaval has passed, things are looking up- the Star is often a card of good fortune and good luck (think “wish upon a star”) but more than that, this isn’t simply good luck- you’re being guided somewhere. The Star is indeed a navigational tool, and is urging you forwards. This should be easy for you, having come through the difficulties you already have. But all these difficulties too have served a purpose- the universe isn’t just kicking you to see how much you’ll take. Even though you may not have seen it yet, this will be a month of insight for you. Looking both back and forwards, you may find yourself able to examine a greater design and greater order than you’ve been able to see previously, and any new ideas, or retooled plans or old ideas are worth examining. Things may be settling down, but you’re certainly not done yet. Now’s the time when things get exciting, and where the rubber meets the road for you. But at the same time, take care of yourself. The Star is a very pie-in-the-sky card, but you’ll need to continue to tend to yourself and make sure your health, mental and physical, remains a priority. Another 5 appears this month, and it seems to be, surprisingly, not a bad fit for you! Last month found you moving through changes, and this continues on into the spring. 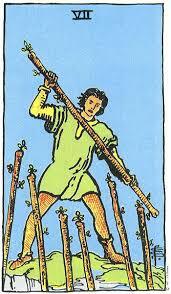 But the 5 of Swords tells us that defeat may be on the horizon; time to abandon our quest and start anew, right? Not at all. The 5 of Swords tells of a need to rethink. Examine what’s not working for you- where does your implacable force of Taurean stubbornness meet an immovable resistance? The third decan of Taurus is noted for being fairly flexible and imaginative, and now’s a good time to embrace that. The 5 doesn’t mean defeat, but rather a new approach is called for. Your journey continues onwards, dear Taurus, and your dreams and highest ideals continue to call you. Just because you run into some resistance doesn’t mean you completely change your goals, but rather you detour around that resistance. Sometimes that detour takes you somewhere new and very interesting! You’ll be the wiser and richer for changes this month, and a great deal of this card tells of your own ingenuity and new ideas. Don’t be afraid to blaze a trail where you feel you need to. Your goals don’t change, but how you get there might. The shift is back to the practical front this month, and a need to roll up your sleeves and get dirty. The 3 of Pentacles promises prosperity and expansion, so don’t be afraid to work hard. Much like an early spring planting, you may not immediately see the fruits of your labor- Pentacles is traditionally one of the slower moving suits in the Tarot. But it’s also one of the most forceful and inevitable. Once set in motion, things move towards their conclusion in this suit. It’s time to take the previous month’s development and insight and put it to use. 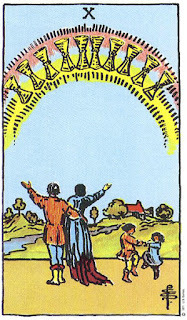 Overall, the 3 is a comfortable card, indicating a time of expansion and productive work. In the shorter term, look for new opportunities and recognition for your work in the past. And looking ahead, take that momentum and build towards a new future. You don’t need to go out of your way to get noticed, but at the same time don’t hesitate to stand up and be recognized for your contributions this month. There’s a chance of you putting your ego ahead of your cause this month, so remember to stay goal-oriented. Situations and events may seem like a coincidence this month, but you’re actually being led somewhere new. Don’t be afraid to focus your energies on goals rather than keeping other people happy! I could start this off by saying something about out of the frying pan and into the fire, but that’s really not the focus for you this month. Sure, things are changing, but that scary fiery example just doesn’t fit- it’s simply not that bad, and what you may have been fearing hasn’t come to pass. The sky hasn’t fallen, and now it’s time to take a look outside. 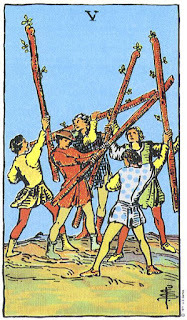 Previously we encountered the 7 of Swords, indicating new information, and this month the Hanged Man promises change. 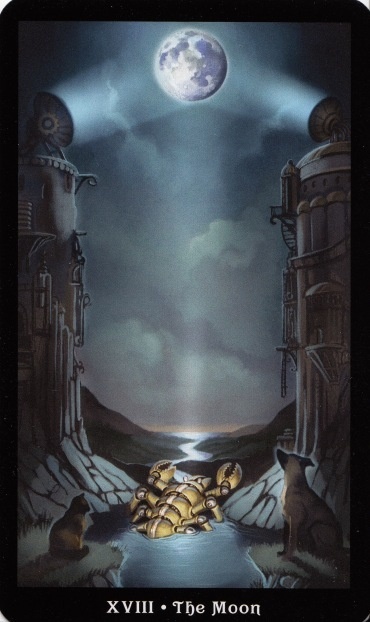 But let’s not look at that in terms of more stress and difficulty- rather, the Hanged Man tells us that most of the difficulties are behind you, and it’s time to take what you’ve learned to heart. The Hanged Man has a sense of peace this month, and despite a great deal of energy, you’ll be able to see where to put that energy much more clearly. This isn’t a time to lament, but rather to be active and forward thinking. 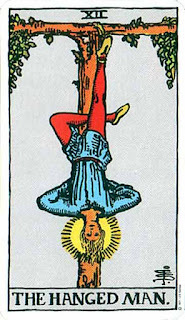 The Hanged Man is not about suffering and about what you’ve lost, or had to endure. Don’t be a victim, but rather be a fighter. This new month means you’ll have plenty of opportunity to make use of a new freedom coming from the fact that you’re no longer concerned with the more petty things in your life that previously may have held you back. Look all around you this month, you’re bound to find something new. And with that new viewpoint, you can address what’s really important in your life. 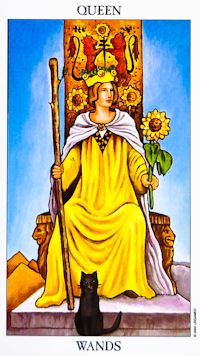 The Queen of Wands is a natural leader, true enough. 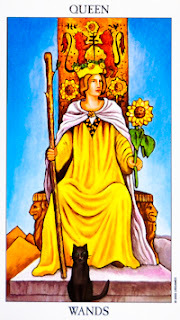 But she’s also a Queen, with a focus on support and consensus building, and brings a sense of maturity and grace to the month ahead. Of course, the Queen of Wands is also known for a lack of patience towards those who don’t agree with her, so this is definitely one area to keep an eye on this month. Be kind to your partner and your friends, and don’t forget those who have helped you to get where you are today. You can look forwards to a great deal of excitement, enthusiasm and spring fever this month, wanting to get out there and do all kinds of great works. Good for you, definitely let that be your guide. But at the same time, remain focused and try not to dance around and waste your energy. Two of the stars in your sign are Bellatrix and Betelgeuse, hanging out in the constellation of Orion and lending a ton of energy to your sign. Keep in mind that the Queen, likewise, is a Fire card. Fire is a great suit, but needs to have direction and focus, otherwise it can burn out of control and wreak all kinds of havoc. Enjoy your new found prestige and success (after all, the Queen is sitting on her throne) but don’t let it go to your head. But overall the Queen is a flexible and adaptive figure who can take direction just as well as she can give it. Strike a balance between these two this month and you’ll find your kingdom (Queendom?) growing by leaps and bounds. From the Wheel of Fortune to the King of Pentacles, things are looking pretty good for you this month. What first struck me about this card is the “self-made man” aspect to it. Or self-made woman, you get the idea. Having been handed the pieces last month, this month is about putting them together. Your naturally outspoken nature serves you well this month, and in the King of Pentacles we find a good balance between expressing those opinions and ideas and being practical, with an eye towards other people’s roles and feelings. The King is a practical and hardworking figure, and though the King can represent a stable, established position, you may want to consider self-improvement projects. It’s a great month to start spring cleaning, take on a new exercise program, or get started on home improvements. All these areas fall under the King of Pentacles, and it’s just a question of taking the next step. You’re in a stable, safe position this month, and you’re fairly well prepared for the next time the Wheel turns. Enjoy a prosperous month, but look towards the future. 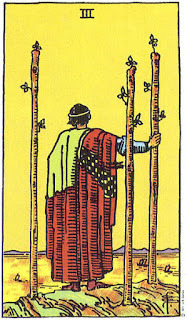 Another feature of the King of Pentacles is an ability to take the long view of things. Look ahead, and lead everyone according to your own designs. Be patient and gentle with others, and wait for them to come around to your way of thinking. Your ideas are solid, but there may be those near you who need convincing. And in the process, all that will do is strengthen your own certainty and resolve, and allow you to address anything else that may crop up. The Pentacles court cards are definitely making an appearance in your sign this month! Much like the previous decan, you have a focus on practical matters. You too have been handed the pieces, and now it’s time to assemble them into your throne. However, here is a focus on other people, and appreciating their differences rather than pressing ahead, insisting on your own way. Look at the situations you find yourself in this month, and you’ll be able to make good use of what you have. 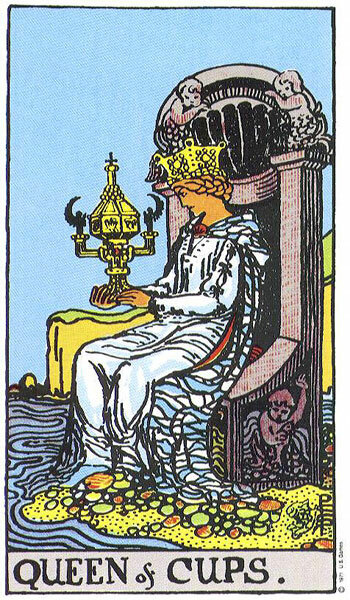 The Queens focus on Water, and the suit of Pentacles on Earth. Put Earth and Water together, and you don’t necessarily get mud; you get the ingredients for good soil and a great garden. 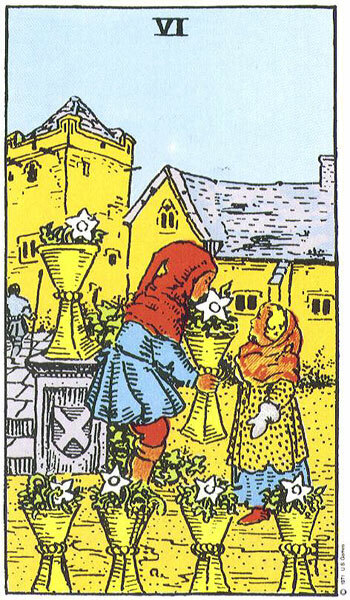 The suit of Pentacles is a slow moving one, and the idea of a garden here means that everyone has something to contribute this month. You are definitely not in it alone, but need to step up and guide everything and everyone along the same road. Consensus is one thing, but don’t be a pushover. You’ll be called upon to stand out and lead others, so don’t be afraid to take on the role of “den mother”, both supportive and helpful, but not taking any nonsense. This month means the application of March’s Temperance card- things blending and mixing together, and now that blending and mixing is taking place in yourself as well. 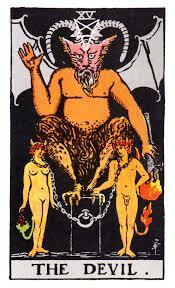 The Devil is a complex card, and does bear a warning for you this month. But on the other hand, the Devil can be a useful teacher. What areas of life are you getting complacent in, and how are you making a martyr of yourself? The previous month’s successes have given you a comfortable position, but now is not the time to let your emotions rule. In the Tarot the Devil is governed by Capricorn, the sea goat. There’s a strong association with Water here, which fits well with Cancer as a sign. However, the Devil indicates deep, perhaps even hidden factors you may not readily be aware of. While the Devil may bring to light uncomfortable areas, we have the option of running away or facing the things the Devil shows us. No one can make that decision but you this month, Cancer. And should you find yourself retreating, that’s ok. If you’re not ready, don’t let anyone else tell you otherwise. But what’s seen can’t be unseen, and what’s unseen will become much closer to seen this month. But don’t be afraid, you certainly have the strength to deal with new revelations, both about yourself and others. Sometimes other people can be brutally honest, and sometimes what they’re saying is complete hogwash. It’s up to you to see things the way they really are, and to change what you feel able to change. There’s a chance of feeling overwhelmed, and it’s all too easy for you to give up. But despite being a more difficult road, the rewards you can reap this month are likewise great. Diplomacy may not be a strong suit for you, Leo, and this month is about leading by example. Previously, your convictions (some might even say stubbornness) have led you to where you find yourself this month. It’s time to commit to a path, as you find yourself at a crossroads, and a need to move on from where you are. The Knight of Wands was only the first phase, and now the 3 requires further commitment. But don’t be afraid of making commitments, as it’s consistent with your path, and with the certainty and leadership that’s brought you this far. Your convictions and dedication are certainly impressive to those that know you and are close to you, and the worst thing you can do this month is to vacillate between two of these Wands, uncertain which way to tip things, and which way to direct your strengths and energies. In that sense this month is very much a continuation of what’s brought you this far, and your goals and directions change very little. However you do have a need to dig yourself in- you’ve come this far, and now is not the time to change directions midstream. Are you feeling any doubt and uncertainty this month? It would be more surprising if you weren’t. But though you may not see the ends just yet, you’re on the right path so far. You may find yourself giving pep talks both to yourself and others. Remember how you got here, and all that you’ve done already, and don’t let any doubts get you down. You may find yourself setting out on your own this month, and taking on a new direction than the previous month’s Queen of Swords. You’re not so much leaving behind as you are moving off on your own, and moving off means you’ll return when the time is right. 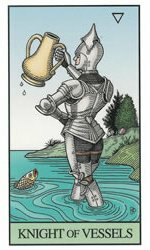 Your April is about quests and journeys, as the Knight of Cups often is equated with Parzival, off to hunt down the Holy Grail. The quest takes Parzival a lifetime, but your quest may be a little shorter. The focus is very much on spiritual matters and relationships this month, and even old Parzival didn’t make the quest alone. 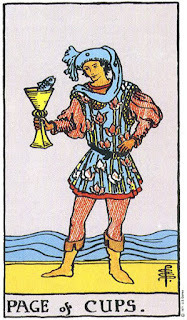 The suit of Cups here emphasizes a need to follow your heart, even if it means leaving some things behind. Ultimately Parzival does gain the Grail, but is very much transformed in the process, and so, it seems, will you be, this month. Though the story of the Grail is a long and complex one, your focus is not on hardship and separation, but rather what you discover along the way. Bringing things together under a common end is your forte this month, as the Chariot promises a month of strength and dominion. A natural leader, the Chariot seems like a good fit for you, and in many ways this is the case. But keep in mind also that though the Chariot means a month focused on decisive action, you may find that you can’t avoid some issues. You may need to push them aside but will ultimately have to address them. Any underlying issues or challenges should not be seen as signs of weakness but rather opportunities to strengthen your skill and leadership. Don’t be afraid to embrace the opposites the Chariot embodies. Though your force and will are the most useful tools this month, you should not just gloss over any issues or insecurities you may have. Facing them may be challenging, but those things that go unacknowledged this month can wind up leading you around instead of you having control of them. 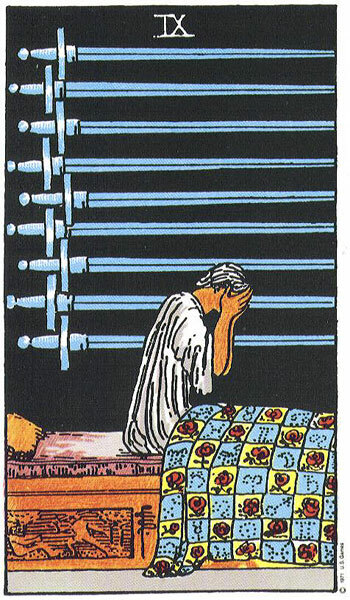 The 8 of Swords previously advised of a need to address these issues, and though it may seem some of them are dying hard, remember that you’re just honing your skills when you face them. There may be a number of tasks demanding your attention this month, and that’s fine. Prioritizing is important, but just make sure you set aside time for yourself, and don’t let the Chariot’s demanding nature wear you out. Here’s where you’ve been led to this month. 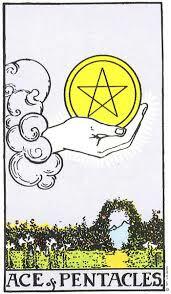 You’ve gone from a Knight of Pentacles to the High Priestess, now you’re back to the beginning, or so it may seem, with the Ace of Pentacles. The Ace indicates you’re at the start of something new, but don’t let that card fool you. You’ve come a long way already, and the fact that this card pops up in Pentacles means it’s the culmination of a lot that’s come already. 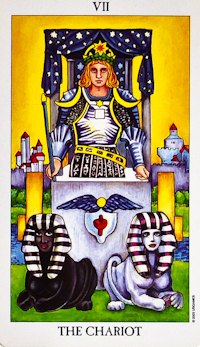 Looking back again on the last couple of months, you’ve had a transitive, moving card in the Knight, an opportunity to gain insight and understanding with the Priestess, and now a chance to launch the whole thing into motion with the Ace. Pentacles represent the end result, the tangible outcome of a long process, and this month is about beginnings as well as endings for you. You’re in a position to enjoy all that’s come before, and to continue to build with what you now have. A little older, perhaps, but definitely wiser this month, you’ll be able to find new connections and new outlets for your energy this month. However, Pentacles as a suit is a slower moving one; feel free to slow down and take things at your own pace, as you’re definitely calling the shots this month. Expect some capital to be coming your way, and keep in mind it’s just that-capital. It’s only useful in terms of what you do with it, so don’t let it sit idle! And remember, you may not see every last little step in the path, but rest assured, you earned this. What remains for you this month in terms of friendships, partnerships and relationships of all sorts are solid. The previous month may have brought some upheavals, but this month you’re standing on the bedrock of what really matters, and what will endure. The Lovers also has the meaning of complementary parts. They are not necessarily the same, and the card doesn’t necessarily indicate a romantic relationship. The two figures represent rather parts of a machine- distinct, yet best when they work together. And that’s the focus for you this month, finding how and where things fit together. Look for patterns, look for connections and opportunities to network, both in a personal and professional sense. Reach out to others, get involved or volunteer this month, and you’ll find these connections bearing fruit. 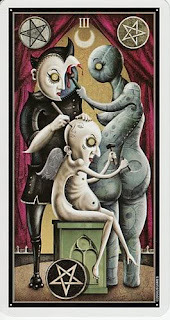 Looking at this strictly in one sense may mean you’ll miss other, unexpected ways this card’s energy may manifest, so try to keep an open mind. 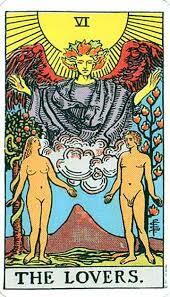 At the same time, the Lovers is a practical card, so don’t neglect what’s right in front of you. How will you put the parts together? Your life will be an interesting collage this month; there are a number of parts to a collage, and together they create something different than what they would be individually. 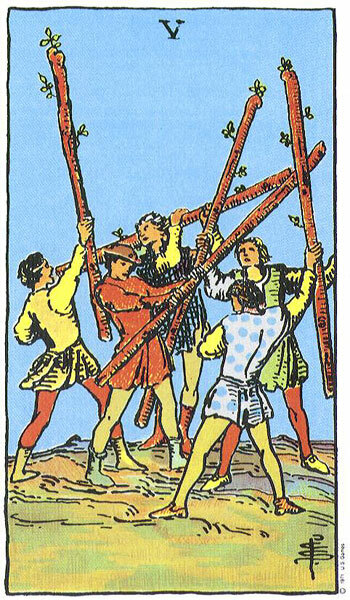 It says in the Bible, in the book of Isaiah, to “…look to the rock from which you were cut, to the quarry from which you were hewn.” This month brings the 5 of Wands, which is not really more conflict, but rather just sparring. There isn’t a strong sense of a fight here, but rather getting back into the mix and seeing what you need to work on. Are your ideas being challenged, or are you finding yourself frustrated in regards to a goal or end you’re pursuing? Don’t worry, there is a way around your obstacles. The challenges you face this month are not that serious, and will benefit you in terms of how you now think about them. What are you doing “outside of the box” this month? You’ve come this far, and perhaps conventional thought and the way you’ve done things up until now may need to change. But you’ve come a long way, and you have a lot of tools at your disposal. Keep in mind that you should not be worried, as you’re not looking at anything new there that you haven’t already tackled and aren’t prepared for. The best response to changes is to take it one step at a time. Does it seem like a whole massive assault on your senses? Break it down into its component pieces, deal with each one as it comes up, and before you know it you’ve got a whole lot of little pieces taken care of, and not much left to worry you. It would be a mistake to look at the Moon as an entirely passive card. You have other things to do besides sit back and watch things unfold as the Moon reveals new depths to your situation and reveals new abilities and new aspects to yourself. It’s true, the Moon is a strong indication of many hidden things becoming revealed this month, and you’ll likely find a number of connections and new ways of looking at the world around you. You may want to just sit and marvel at how new and fascinating the world seems as you continue through the month. Start a journal, record your impressions, but don’t get too lost in daydreaming this month. The Moon shows you a way ahead, and you’d do well to take that route. Press forward, even through your own inertia, which may be on the rise this month. Don’t worry, it happens to the best of us. Make a habit of being active this month, and getting outside and doing something physical is not a bad idea, even if it’s as simple as a walk around the block now and then. Oddly, your strengths will lie in that same area that may cause you to stop and daydream a bit too much- introspection and thought. The question is, are your daydreams leading you somewhere, or providing some new insight? Likewise, watch for symbols and recurring dreams. Your enjoyment of unraveling things and finding hidden meaning will come in handy this month. Don’t act too quickly or rashly, and find out what’s going on below the surface. The Ace here bears a sense of receptiveness, strangely enough. 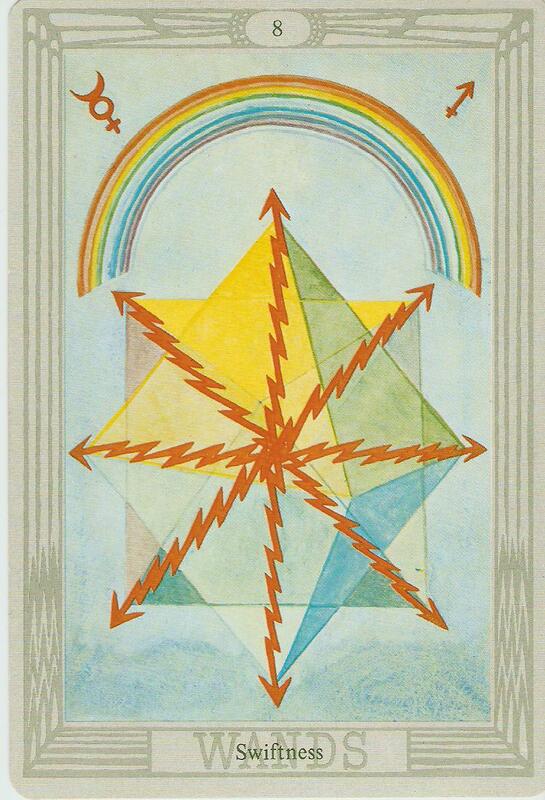 It represents what you’re being given, and is something of a shift from the previous month’s King of Pentacles. The environment around you, and other people in your life are providing you new opportunities and challenges. The King indicates a state of preparedness on your part, and now it’s time to put your resources to a practical use. The Ace also puts the focus on communication and ideas for you this month, so be sure to keep your eyes and ears open for what other people contribute. You may find that other people have useful input, and a breakthrough may come this month. Like all the Aces, however, you’ll find that although you’re handed the tools you need, it’s up to you to put them to use. Take a calculated risk (because after all, calculation is a strong suit for Librans) and impress other people with your solutions. Your sign is a cardinal Air sign, and the Ace of Swords is a good fit for what you usually incline towards anyway. So act according to your nature this month, and you’ll find yourself in a fairly good position overall. Moving on from the previous month’s Page of Swords, direction is coming clear. The Page previously had a sense of vigilance and observation, and now, having observed, your time to act is now. 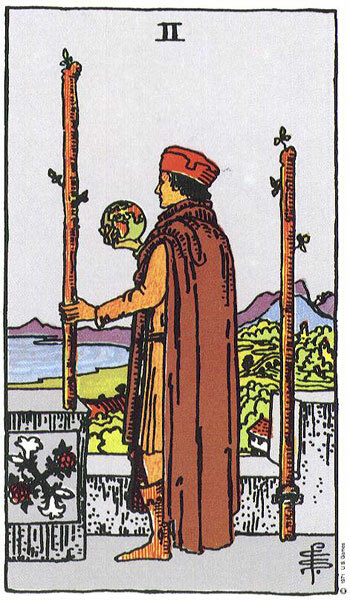 The 8 of Wands is a card of action and decision, and it’s time to put aside that Page energy with its contemplative, examining nature. The 8 tells us not to keep one foot on the dock and one on the boat. Rather, the time for action is here, and perhaps even to push off and leave the shore behind. This card is also an indication that you’ll have plenty of support and backup. You are ready for this, even though you may not feel like it. But put doubt and perhaps even fear out of your mind; instead let action lead you, and let it snowball. As you succeed you gain confidence this month, and this card has a sense of things gaining momentum. You’ll find doubting Thomases and naysayers swayed this month, not by your clever rhetoric but by success coming from good old fashioned elbow grease. The previous month’s Page can be a figure that is prone to worry; that’s ok, as long as you don’t let it keep you from taking a chance and working towards your ends. Take a chance, you may be pleasantly surprised by what happens! It’s pretty much business as usual for you this month, but with a bit of a different focus. The Page of Cups here takes on the aspect of a student. Not necessarily a book-bound student cramming for an exam, but rather a student of the world, who learns by observation and hands-on experience. The more you learn, the more you know, and the more connections you find. You're taking on the role of an apprentice, in many ways. Work with what's already there, but add your own twists to it. The previous month was about the more practical side of things, and now this month brings with it a chance to sit back and see how things work. There’s a focus on developing relationships in this suit as well, and the Page means a chance to fine tune your intuition and develop your abilities. The practical, bill-paying side of things has been pretty much taken care of this month, so it’s time to focus more on yourself. The hands-on experience here comes from you yourself, and you’re both student and classroom this month. This month builds on what has come before, but definitely takes things in a new direction. Ask questions, seek advice, read about others who have been in a similar situation, but most of all don’t be afraid to experience it firsthand. Your intuition and gut instincts do not disappoint this month, and the High Priestess advises you to keep an eye on the world around you. What secrets does she have to show you? This can be one of the tougher cards to interpret in the deck, because she tends to speak in riddles, yet at the same time everything you need to solve the riddle is right in front of you. So we're met with two aspects in the Priestess- you have what you need, but it's just a question of seeing it. There's a story about old Archimedes, who was presented with the challenge of determining if a given amount of gold was pure or not. He struggled with the problem night and day, and finally was at the end of his rope. So he went to take a bath. As he climbed in he noticed the water level at the edge of the tub change, and realized that was the solution. So the moral of the story for you this month is be open to what's going on around you. Find a solution, but remember that you don't need to run yourself ragged to find your legs, and don't look everywhere to find your eyes. Secrets and new directions will be revealed to you, and so you'll need to strike a balance between tending to the more mundane matters we all must address and looking to what's just beyond your current reach of vision. But take these both to heart, as both are useful and necessary to find the answers you are looking for. This month brings a new perspective to what you've been dealing with, and overall your sign tends towards new insights to your situation. The good thing is, there aren't a lot of changes or upheavals to require your attention and energy, and you can focus on putting the pieces together. 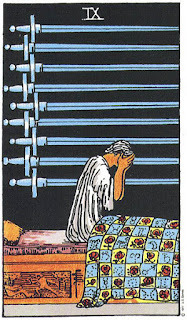 The 9 of Swords tells us that you may find things are not quite the way you had assumed. But never fear, dear Scorpio, you may be a little stunned by this sudden insight and grasp of the situation, but it's for the best. Take what you know and go with it, apply it to your life. 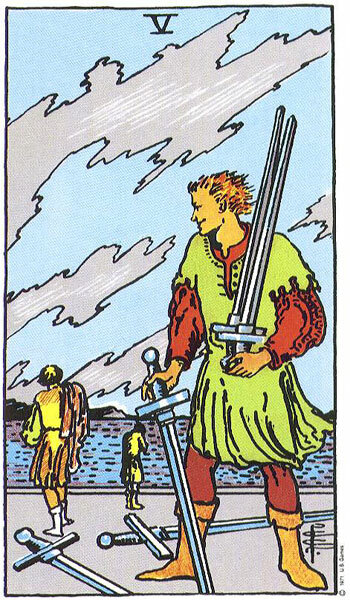 The thing about the suit of Swords is its very cerebral, mental nature. This is the ideas phase, so take ideas and turn them into reality this month. The 9 here can have a sense of worry with it- what are your concerns? You would do better to relax, try to get some R and R and come back to the problem with a fresh mind rather than worry at it and keep turning it over in your mind. But this card and this month also promise a breakthrough for you, and it's up to you to take your solutions and put them into action. Your worries don't seem to have much manifestation in the world around you at present, so in this sense it's a relaxing, easy going start to your spring. The focus here is not on worries and alleviating those worries; those will take care of themselves, and you have the ways and means to address them. It's a good time for contemplation and thought, and be sure to keep track of your ideas. If you're prone to being a bit scatterbrained now and again, you may want to write things down that you want to remember. It certainly seems like other people are playing a role in your life this month! The 6 of Cups points to reconnecting and renewing relationships with others. Look to the community around you, and look to those close to you. Revisiting your past, with its fond memories and the strength you can draw from them, will provide you a good impetus forwards this month. You're not so much living in the past as you are taking it easy this month, and working with what is already on hand. It's not a great month for you to start new projects, and in some sense, not a very ambitious month. And that's not a bad thing. Sometimes you need to work on fine-tuning the skills and knowledge you have at present, as these require your attention. You may also be calling upon your past experience in helping both yourself and others. You may find yourself in familiar situations, with a new twist on something you've seen before. If that's the case, you can re-apply old knowledge and wisdom. These are not static things, sitting gathering dust in your library, but rather tools for you to use in your everyday life this month. Innovation and thinking outside the box are highlighted for you, especially where others are concerned. Are you looking to take a relationship to the next level? Now's the time to do it. You may be surprised at what other people reveal to you this month! Another 4 for you this month, and the focus is changing a bit. 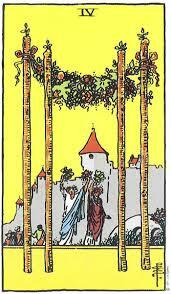 The 4 of Wands gives a sense of coming home. Seeking leads to finding this month for you, and the 4 here tells of finding your place in the greater scheme of things. You've been led out of your comfort zone before, and now you're finding a new place to settle into. This is not simply going back to where you were, but rather finding a new place. This is, like the 4 of Cups the previous month, a fairly stable card. The spring brings you a peaceful, happy time, and good company as well. You've come up to this point, and now it's time to enjoy the journey. This can definitely serve as a launching point for further endeavors and new directions, as the 4 is a jumping off point. You've brought yourself this far, and now the journey continues on. It's the simple joys in life that can fuel that journey as well as make it worthwhile, and this month is a perfect time to do both- be inspired and driven this month, and take time to smell the newly budding roses. There's a great deal of synergy in this card as well. 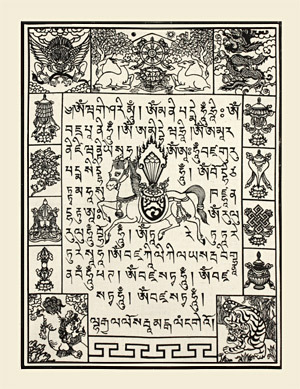 The number four is often one of balance and harmony; think of the four Elements working together towards a common end. Harmony is the name of the game, and seems to flow naturally for you this month from simply being. You won't have to look far to find that balance and peace- the question is, what do you want to use it for? 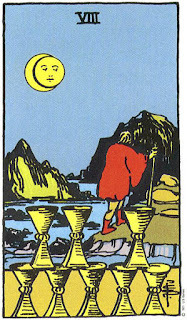 The Hermit, appearing the previous month, now strolls back into the community, disguised as the Fool. Time to take all that learning and training and step out to the edge of the cliff. There's a danger with the Fool of a false step, but remember that the Fool is not completely unprepared. You're looking at a dynamic month with a good deal of demands on your time and energy, but at the same time challenges and demands are not overwhelming. The Fool tells of new vistas and new situations to be conquered. The Hermit has prepared you for this, and it's now a question of stepping off the edge. You don't need to worry about falling, as your intuition and understanding of the situation are sound. Put doubt aside this month, as all it will do is hold you back. The course ahead of you is the right one, and constant uncertainty and second-guessing yourself can only slow you down. Do you seem overly confident to others, certain where you may not have any real reason to be certain? It's not that you're being, well foolish, but rather that you have information and insight that others may not. Trust is the key word for you this month, and in no area is this more important than trusting yourself. You can do much more than you think you may be capable of this month, and you'll often find your seemingly blind optimism is anything but. 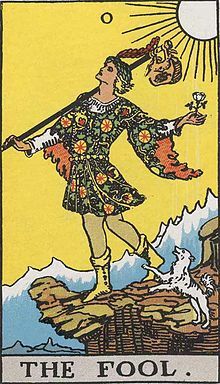 Although the Fool doesn't make any guarantees, and there's always a risk involved, taking this card in context points to great opportunities for you. The risks you take are calculated ones, so don't let others hold you back. Don't abandon reason and thought, and don't go to the other extreme of too much caution, either. The 4 of Pentacles is a card that we can interpret in two ways. One of these is clinging to material resources, afraid to let go and afraid of losing what we have. The problem with this overly cautious attitude is that we miss opportunities, and miss what could have been for the certainty, limited though it may be, of what we have already. The other is that the 4 provides a good, stable foundation, and what good is a foundation if you don't build on it? This will be a month of expansion and growth for you, and it's time to turn the good ideas you may have knocking around into more practical channels. The 4 tells us that things are favorable for such an investment of your resources. However, don't wait for things to be perfect. If you wait for ideal conditions, you'll never get started, because there will always be that "if only" preventing you from getting started. This suit also is a practical one, and not much given to deception and subterfuge. Take it at face value this month, and you won't be disappointed, but be informed and careful in what you do. Don't miss opportunities this month, thinking you can wait for a better chance. The phrase "there's no time like the present" very much applies to you this month, so look around and see what's right in front of you! From decision and commitment, we move to action this month. Things are gradually unfolding for you, and the Knight is a figure in motion, moving slowly and deliberately, but with tremendous strength and purpose. The previous month's 3 of Wands indicated a decision to be made, and now it's time to stick to your guns and follow through on that decision. The Knight is an eminently practical figure, able to move patiently to get things done right and done thoroughly. Though April will be a month of transition for you, it will be marked by steady progress and development. The end is not yet close at hand for this phase of your journey, but you're definitely on the way. No need to rush, your day in the sun will certainly come in its own good time. For now, focus on the task at hand, and working on one thing at a time. Avoid the feeling of being overwhelmed, the Knight advises. There are steps to come, but if you're jumping around looking ahead of where you are, you might miss what needs to be done at present. Look at the trees in front of you, not the whole forest you still have to cross. These things will come up in good time, so address them then. For this month, work with where you are, and let things come in their own time. 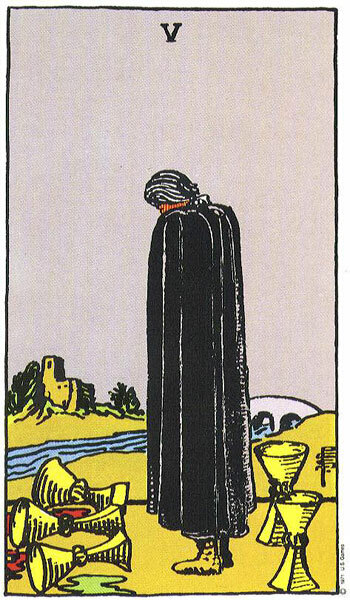 This is not always the most comfortable card to see, but very often a necessary one when it occurs. Things are re-balancing emotionally, and you may be facing some endings. Perhaps a relationship is ending, perhaps things are changing around you. But the 5 is a card of change and transition, and not by any means a permanent state. Look to what remains, and think of how this can expand into the newly-opened areas left by these endings. Those of you who garden no doubt know the value of removing weeds. There's a finite amount of space and resources in your garden, and weeds can sometimes compete with what you planted for those resources, and if left unchecked, can choke out the plants. You may find yourself removing things you may not really consider weeds, but not to worry. Change is inevitable, and not always comfortable, but can be for the best. Think of it as re-allocating your resources and energy. It's time to make some changes, perhaps even time for a little spring cleaning. But when you free up that space and free up that energy, you can bring about new things. Out with the old, and in with what's already there, waiting for its chance to bloom. You may feel like you're not ready to let go, but do look on the bright side this month. Try not to focus on what is passing away, but rather what remains, as this may need your attention, direction and guidance to grow into what it can be. 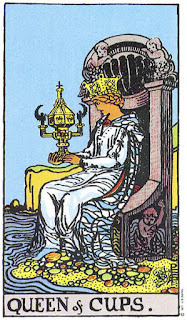 The Queen can often be an almost passive figure, with her strong connections to elemental Water. But nonetheless, just because we don't see what drives this figure, it doesn't mean she's wishy-washy. The challenge the Queen presents you this month is to trust your inner voice. Often shown gazing into her Cup, the Queen follows her own directions, marching to the beat of the drummer that perhaps she alone may hear. The last couple months have focused on relationships and the outer world, and this April the focus turns inwards. Driven by the good fortune of the previous month's 9 of Cups, you now have the freedom and experience to look within yourself, to find out more about you, and to gain a deeper understanding of what you want out of life. Skepticism and logic are no stranger to you, and you can certainly make use of these as well this month- turn those tools inwards rather than outwards to the world around you. Other areas of life are stable, seeming to step aside and let you have the room you need to stretch out and explore. It's a good month to start some self-improvement, and perhaps to begin studying something you've always wanted to learn. In so doing you may find connections and applications you may not have previously noted. Your personal philosophy or ideas of self may also be challenged and open to change. You may well find yourself looking at the world in a new way, examining things previously you had taken for granted. Again, a healthy skepticism is a wonderful thing to have this month, but don't let it take the place of an open, inquisitive and curious mind. Now's the time to defend your ideas, and to respond to challenges. You still hold the high ground this month, so the certainty of your convictions will certainly help you. You're right and you know it. Now let other people know you're right. 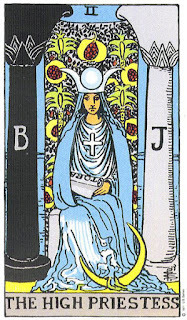 The 7 is a card that brings not so much difficulties, but disguised opportunities. "Why are you being so stubborn?" others may ask you this month. The answer: "Because I'm right, and I know it". 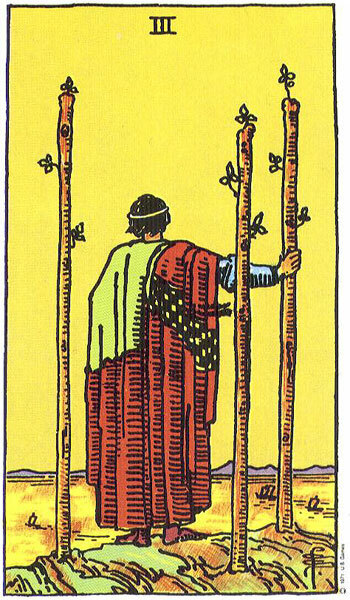 The previous month brought the Judgment card, indicating a calling and purpose you may have been lacking previously, or alternately, a renewal of conviction and certainty, and enthusiasm as well. But don't look at this as being a need to be on the defensive. Other people around you are willing to be convinced, so let your light shine, and explain why you feel the way you do. You're not facing a hostile audience this month, but rather one that is waiting to be convinced. Your ability to remain unfazed will help a great deal, as the 7 does bring some degree of tension with it. But this tension can be turned to positive ends, and in your ability to do this, to defuse the situation and prevent it from becoming hostile, your success will lie. What are you looking at in terms of change this month? There's a big difference for you between simply desiring what you don't have, and looking to broader horizons. 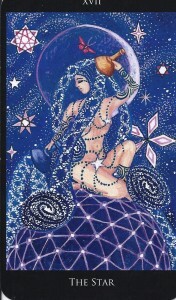 The 8 of Cups tells of a need to expand, to visit new frontiers. Are you planning some travel in the near future? Dissatisfied with the way things are in your life? This month calls for careful evaluation. 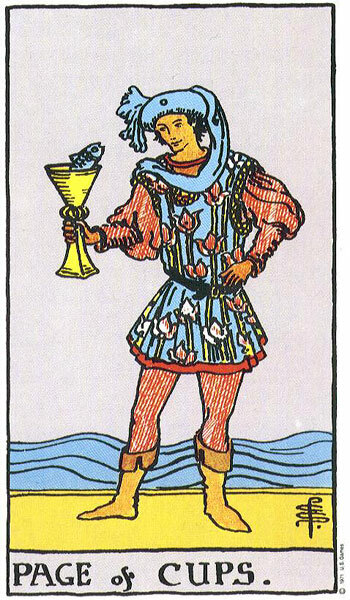 Placed as it is in an emotional, shifting suit, the 8 of Cups has with it a need to draw a distinction between impulsiveness and a desire for something more. Use your good judgment and discernment, and don't become too wrapped up emotionally in your current situation. Avoid change simply for the sake of change or novelty ,and make it count. The grass may be greener on the other side of the fence, but ask yourself- does that mean it's time to move, or does that mean I should be tending my own lawn more? No one can make that decision for you, and you may find it's not quite so black and white. Some areas may call for change, others may call for you to work on what's already there. Underlying this is a sense of direction, as the 8 of Cups also advises you to trust yourself on this. Does it seem like you're being called to a certain set of changes much more than others? That's what to look to, and where you should draw that line between a desire to change and a momentary impulse.Exercise good judgment on your situation this month, and evaluate the likely outcome of any changes you make. Foresight is your friend this month, so use it well, both in what you change and what you don't change! 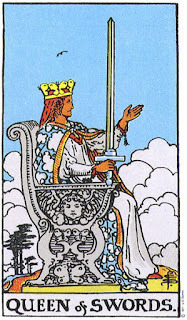 Seeing the Queen of Swords in your decan tells of a need to follow through. Make your visions a reality. 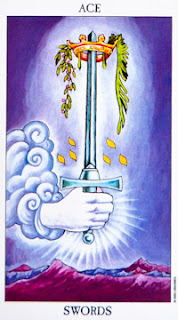 The past month brought with it the Hanged Man- what has this change in perspective shown you? 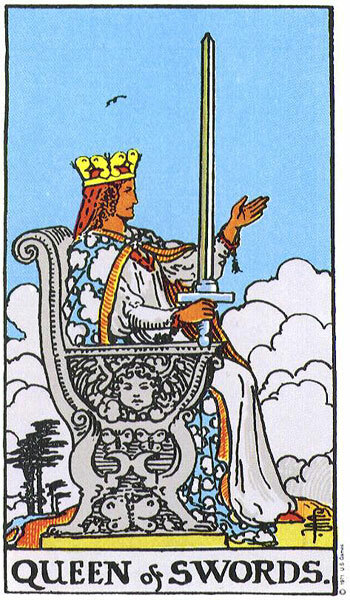 The Queen of Swords embraces two elements, Water (the Queen aspect of the card) and Air (the Swords). So the call this month for you is to remain true to your visions and your idealism, yet incorporate the practical, responsive yet cunning nature of the Queen. This is a time to move from visions and dreams to making that a reality. You may be looking at some seemingly impossible task, but the Queen is nothing if not adaptive. Find a way to accomplish what you feel called to accomplish this month. What you need to make it all happen is certainly there, though perhaps not out in the open. Your challenge this month is to find new innovations of existing material; to reuse, repurpose and redesign the world around you. 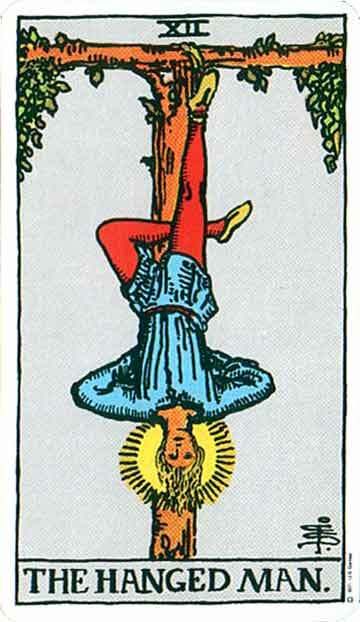 The Hanged Man has shown you this is possible, and perhaps even given you some inspiration. Now it's time to take what you know and move it out of the realm of speculation and into the physical world. The Queen is a figure of ideas, and so ideas should be your focus at present. Remember to keep one eye towards what you have on hand, and don't get too wrapped up in what might be. "If only I had _____ " should not be in your vocabulary this month, and there's a chance, although a slim one, of this holding you back. Don't miss opportunites, and don't let it be for lack of trying. You'll be pleasantly surprised as to what you can accomplish if you put your mind to it! New and previously unseen channels of thought are opening up for you this month. Don't hesitate to make use of them. Here is a card that may not be the best match for you, Pisces. 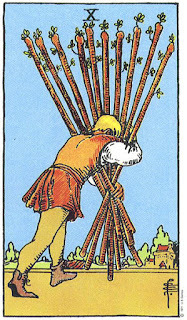 The 10 of Wands can take on the troublesome aspect of a burden this month, so you'll need to find your calm center. 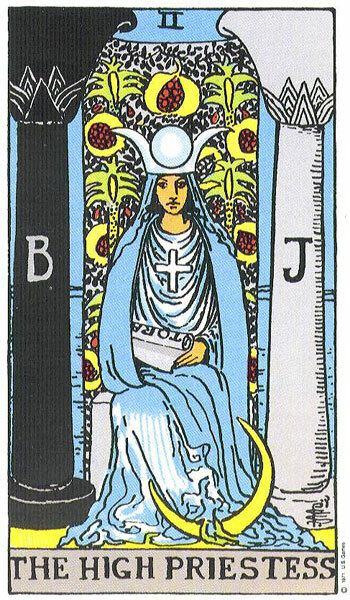 But don't be too worried, as this 10 is a good card to see in terms of a foundation. Were it not for the work you've put in and the success you've had, looking back to the previous month's 8 of Wands, you might not have these burdens to worry about. 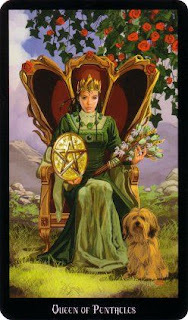 Heavy is the head that wears the crown, and that seems to be the root of any issues you may be facing this month. Having a natural desire to be around people can help you, and so seek out good friends and good company. Don't let yourself be over-worked, and don't burn yourself out this month, If you can strike a balance between work and relaxation this month, this 10 can turn into a firm platform under your feet. Put things in their place this month, and understand your situation. A ladder can help you, if you're on top of it and know how to use it. But carrying it on your shoulders and then trying to scale the wall will do you no good. So this month calls for understanding of what your obligations are, and equally important, what your assets are. 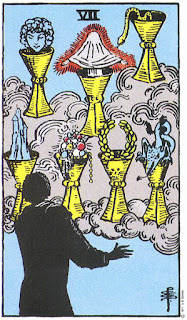 The 7 of Cups is a card of decisions and choices, and these choices require careful thought. There is a possibility of over-extending yourself, and one aspect to the 7 of Cups that you may find to be a stumbling block is the fact that you may feel a little overwhelmed and dazzled, and may get caught up in the excitement of the moment. It's an emotionally charged card, and emotional decisions can be the hardest to make. Though there is an underlying guidance and intuitive reason to this month, do be careful as that intuition and guidance can often be drowned out under the clamor of excitiement and enthusiasm. You're back to Cups after the last month's 4 of Wands, so this overall is an indication of things moving upwards and outwards. And there the emotional factors come into play, as you can get swept up in the excitement of the moment- don't let that go to your head, but rather think it through carefully. The best advice the 7 can give you is to weigh your decisions carefully. Do this, and it looks like a solid and prosperous month for you. Much of April looks like a time to stop and smell the flowers as they begin to bloom. Look ahead to the future, and plan for where you want to be. There are a lot of forces at work that take time to unfold, and time to make themselves manifest. I can recall the old rhyme about how April showers bring May flowers. What are you planting this month? You may not get everything all together all at once, but planning for the time when each piece drops into place is so often the best way to ensure success. Enjoy your April, everyone! I hope your spring flowers are full of joy, and not pollen, if you have allergies. Stay well everyone! eToro is the ultimate forex broker for beginning and pro traders.